« EMC RecoverPoint upgrade fails: Unable to distribute ISO file. Currently UIM/P is unable to expand striped metavolumes on EMC VMAX. Why is it not supported by UIM? Simple answer is because it’s quite complicated procedure. But nevertheless it is supported by EMC. Expanding striped metavolume requires the use of a Business Continuance Volumes (BCV). EMC Business Continuance Volumes are special devices used with EMC TimeFinder® software. Regardless, expanding a striped metavolume with a BCV does not require a TimeFinder license. You can expand device using BCV by following ‘Striped metavolume expansion‘ procedure described in ‘Using EMC Symmetrix Storage in VMware vSphere Environments‘ – see page 59. The corresponding VMFS datastore will need to be manually extended. You will also need to sync the changes with UIM/P database using UIM Service Adoption Utility (SAU). If you have enough space to create a new device with desired size, the answer is no! 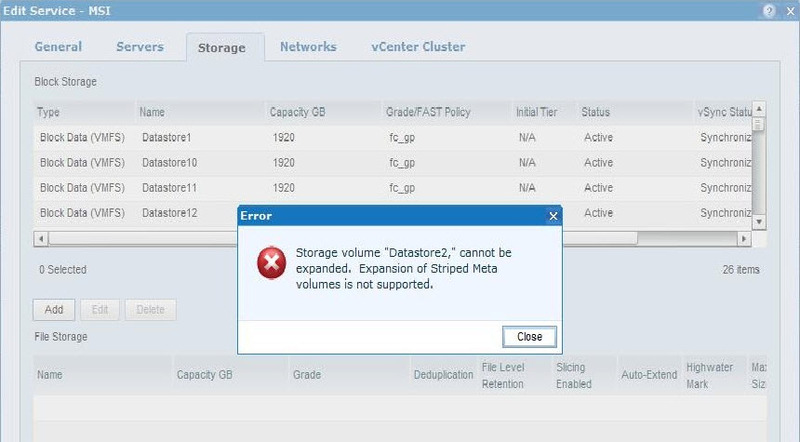 You can provision a new correctly sized datastore, storage vMotion all VMs from the old datastore and then decommission it. If you care about naming convention and you wish to have new datastore name the same as old one you can simply after decommissioning rename device identifier on VMAX, rename datastore in vSphere, rediscover Vblock in UIM/P and use SAU to update UIM/P database to have desired names there. Also note that if using Solutions Enabler 7.1 and Enginuity 5874 and earlier, bound striped thin metavolumes cannot be expanded online, they must be unbound, unmapped and unmasked. Since this process will cause complete destruction of the data stored on the metavolume, any data on the striped thin metavolume must be migrated off before attempting to expand it in order to prevent the data loss. Beginning with Solutions Enabler 7.2 and Enginuity 5875, a striped thin metavolume can be expanded with no impact to host access or to the data stored on the metavolume with the assistance of a BCV.